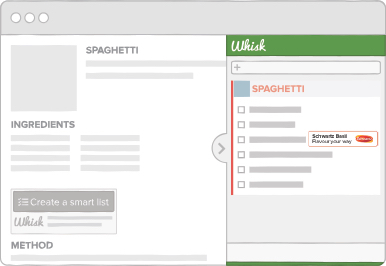 This ad appears next to the Whisk "Create a smart shopping list" button on recipes across the Whisk Publisher Network. This ad appears next to an individual ingredient or item within the Whisk shopping list. For each ingredient, there is one advert slot available. Please submit specific product name, link, or SKU at all available retailers that Whisk will match when a user transfers their shopping list to an online retailer.